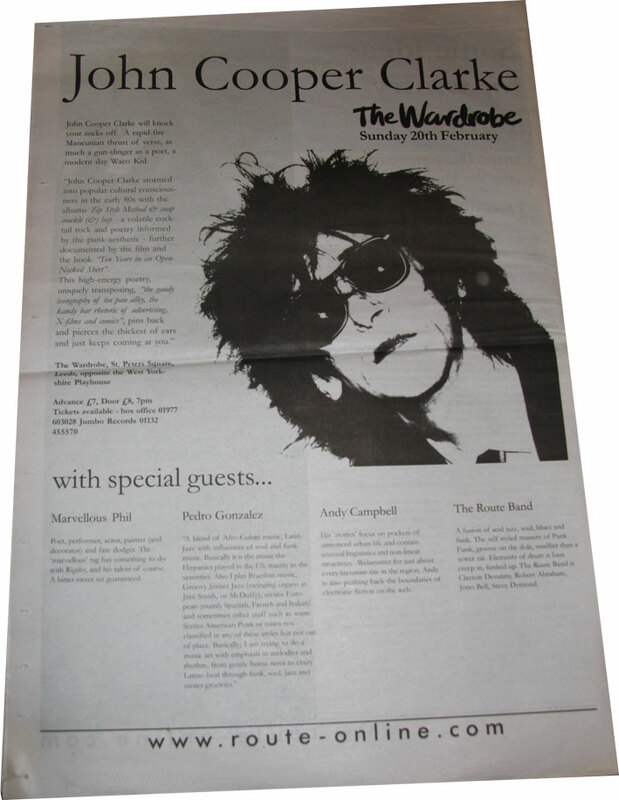 John Cooper Clarke at The Wardrobe, Leeds, February 2000 in the first run of Route Live nights. We’d brought JCC’s friend Eric to the club as a surprise. At spotting Eric, JCC got very comfortable at the bar and was complimentary about the club’s standard of vodka martini. Several drinks later he took to the stage. We’d only booked him for an hour but he was up there for nearly two, clearly enjoying himself. On the day Manchester United had played Leeds United. JCC is a big Red, so started the show with, ‘My mate Eric has recorded Match of the Day, and we’re going to watch it later so I don’t want to know the result. If you are happy, don’t show it. If you are sad, don’t show it. If you are indifferent, well that’s okay.’ It was a magic performance, with only three poems in the whole 120 minutes. We bumpe d into JCC a few months later and he talked about the night. He wondered if it was a serious poetry club we were running because he’d been surprised and amused by heckles from the floor calling for ‘more poetry’. For the record, the actor Steve Husion was there that night and he demanded his ticket-money back. ‘I’ve come to see a poet, not a drunken stand-up comedian.’ We figured JCC’s routine about being served a plate of meat by a German with no sense of irony to be poetry in itself. On the support card that night we had Marvellous Phil Hancock, Andy Campbell, The Route Band (Budists) and tunes were supplied by DJ Pedro Gonzalez. Pedro had been given the nickname ‘The Noisy Spaniard’ by Eric a few years earlier in Salford. It was a name JCC used and we stuck with. I seem to remember he played The Ramones and plenty of early Rock n Roll numbers that night. Not long after this event we made a trip with Eric to Strangeways prison to meet the governor. We wanted to put a JCC show on for the prisoners in a Johnny Cash kind of event. It turned out that the governor was a big fan and was up for it. So was JCC. Not sure why it never actually came off, probably the sheer hassle of trying organise it meant it ran away from us. Pity. It would have been golden. Photos by Kevin Reynolds. At the top, with a vodka martini. And at the bottom with an ever lit Benson and Hedges fag. These were the days when you could smoke in clubs and throughout his set JCC would ask the audience, ‘Anyone got a Hedges, just throw them all up’ which was a cue for a barrage of cigs to fly at the stage like paper aeroplanes.